The chevron represents the mountain ranges of British Columbia. The suns symbolize the light of inspiration, important for entrepreneurship, plus power and strength. As well, the three suns represent Mr. Armstrong’s three children. 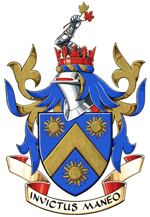 The arm is a pun on the surname Armstrong. The Loyalist civil coronet represents Mr. Armstrong’s Loyalist ancestry. Meaning “I remain unconquered”, this Motto has been used within Mr. Armstrong’s family for many years. The symbolism of this emblem is found in other element(s) of this record. The sun with the blue centre symbolizes the character and attractions of Savary Island in the Gulf of Georgia where Mr. Armstrong has a summer home. 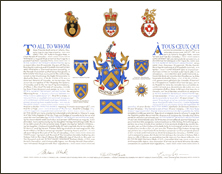 The announcement of the Letters Patent was made on July 8, 2006, in Volume 140, page 2040 of the Canada Gazette.